With a little imagination, Ecobricks can be used for almost anything. 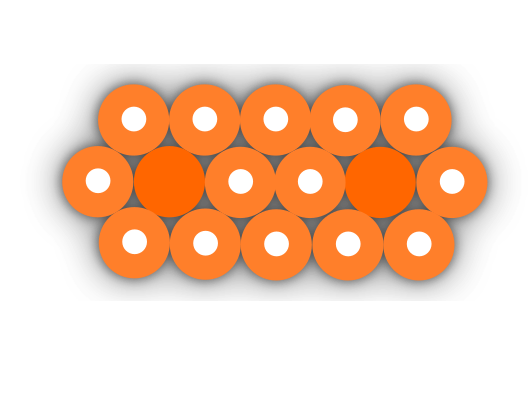 Ecobricks can be connected using tire bands, silicone, cob, and cement*. 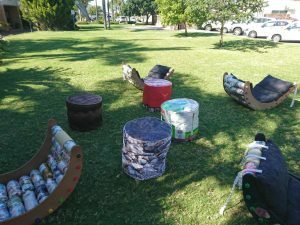 Ecobricks can be used to build furniture, gardens, structures and more. Ecobricks are being used in different ways around the world. On this page, we’ve put together a summary of the most popular applications of Ecobricks. We’ve also created the Vision Ecobrick Construction Guide to help you get started. Meanwhile, you will find a brief overview of each building technique, its pros and cons, below. The easiest, fastest, and perhaps the most fun ecobrick application, is to make Milstein modules. With MMs you can create benches, table, chairs and more. All you need is 12 Ecobricks to start! We have found that silicone sealant works best to assemble the modules. Ecobrick Milstein Modules can then slide into deployment for classes, concerts, meetings and more to make horizontal surfaces. They can be stacked one on top of the other to add one level of vertical height. They can be stacked and stored vertically to save space. Pros: All you need is a few Ecobricks to start! Super easy. Fun. Cons: For indoor use only. The UV rays in sunlight will degrade and fade your Ecobricks. So this is pretty cool– Ecobricks can make LEGO-like blocks. Dieleman Modules, or DMs for short, are a way to turn bottles into modular bricks that can be stacked vertically. 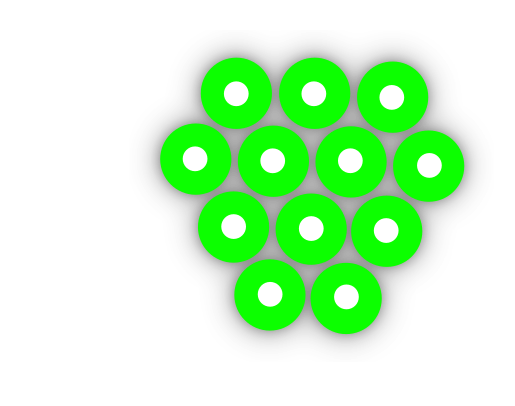 Sixteen Ecobricks are siliconed together to make one DM module. DMs interconnect just like Legos. They stack one upon the other and enable you to make walls, towers and columns, fast and easy without any glue or mortar. The DMs can then be disassembled just as easily. Pros: Awesome for indoor playgrounds and building structures for concerts or fairs in minutes. Can be taken apart and stored just as fast! Cons: For indoor use only. Ecobricks are exposed and thus the furniture cannot be used outside– UV rays will degrade and fade your ecobricks. Untested for outdoor long-term building projects. The most enduring and greenest way to build with ecobricks is using Earth Bottle Building techniques. Known as cob, adobe, wattle-and-daub, and many other terms around the world it refers to the ancient techniques that use of local clay, sand and straw to make a mortar that is resilient, strong, beautiful, and thermal-retentive. Earth Bottle Building is ideal for constructing simple garden spaces, playgrounds and walls. Earth building was used by our ancestors to build homes and structures that have endured for centuries. It is easy and free to make, and involves the children as well as the adults in the construction process. 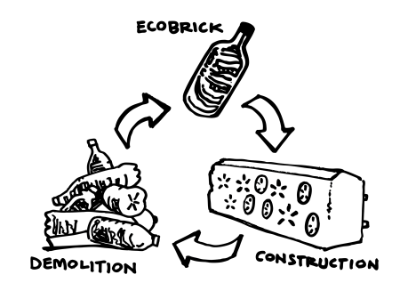 Earth Bottle Building techniques can completely cover Ecobricks, effectively burying them in the construction. This keeps them safe from UV light and other forms of degradation. After 10, 20 or 100 years, when your structure comes to its end (as everything eventually does) your great-grandchildren can extricate the ecobricks from the cob and have them ready for their next application. Pros: Our number one choice for structural building! This method is strong, earthquake resilient, allows curved walls and designs, allows ecobricks to be recycled at the end of the construction, and relies only on 100% organic, locally-sourced materials that cost next to nothing. Cons: It’s outside of the corporate construction paradigm: Your bank won’t give you a mortgage, insurance companies won’t cover it, and your hands and feet will get dirty. Ecobrickers in South Africa have come up with a way to build modular units with Ecobricks. An innovation by Johannesburg architect and ecobricker, Ian Domisse, these simple modules just require a plywood sheet to hold them together. Pros: Great for indoor structures, for concerts or fairs in minutes. Can be taken apart and stored fast. Cons: Cannot be directly exposed to the elements but can be plastered and concealed with boarding material. A combination of traditional post and beam concrete structure and ecobricks has been developed by the Pura Vida Atitlan Ecobrick movement in Guatemala. They have a free PDF manual that describes their Sistema Constructiva Pura Vida (Spanish). Chicken wire is used between two concrete beams to allow the vertical stacking of ecobricks. 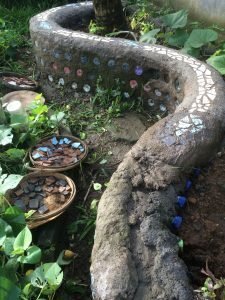 Once the wall space has been filled with ecobricks, the wire is plastered over with cement. The construction method is tested and endorsed by Designers Without Borders, NorskForm (Norwegian Centre for Design and Architecture), and INDIS (Instituto de Investigación en Diseño de la Universidad Rafael Landívar). HugItForward uses this method to build schools that are subsidised by volunteer ecotourism. Pros: A great way to put lots of Ecobricks to use to build a community structure. A hybrid method between traditional construction and Ecobricks. Ecobricks can be recycled when the construction comes to its end. Cons: Uses cement, steels, and non-local materials. 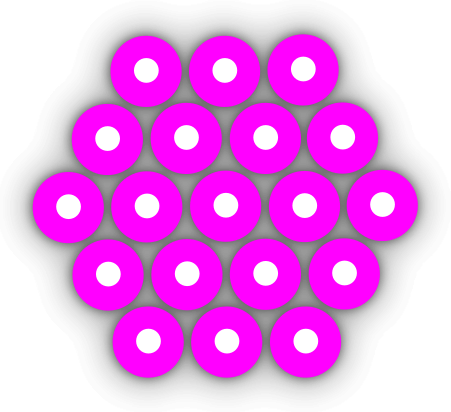 Results in square structures. Requires outside funding. Using ecobricks for free full body exercise. Check out the Ecobricks Fit manual. From baseball bats to boats, the sky is the limit on what you can use Ecobricks for! 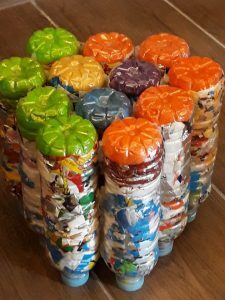 Ecobricks can be used for getting fit, for games and more. You can even use them to build these great rocking chairs – designed by Cara Pearson (South Africa). Download the side view picture here and the full instructions for the chair here. Did you know that Ecobricks float really well? 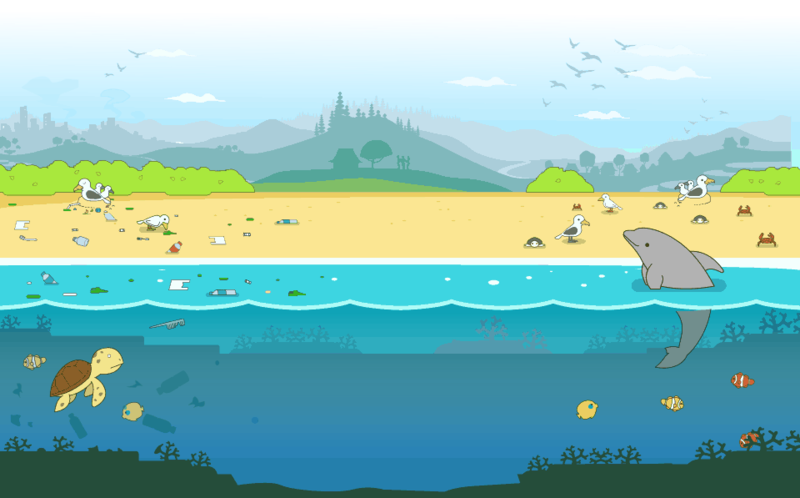 We can’t wait to see the first Ecobrick boats and islands. Have you seen or developed useful applications? Please share with us, or help our team develop this page further. 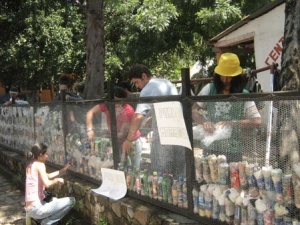 Share your photos on the web with the hash tag #ecobricks. Post your ideas and photos in the comments section below. We advise against using ecobricks with concrete as the connecting mortar. Concrete will solidly hold ecobricks together as walls. However, such walls are impossible to come down without the hard rubble rupturing the ecobricks (note this is not the case with the Pura Vida Atitlan method, as the ecobricks are not bonded with concrete). It is important to think of the next life of ecobricks and the end or our structures. See Cradle to Cradle ecobrick design. For a comprehensive introduction to the the theory and techniques of bottle building, download our free, open source construction guide. Ecobricks are a deep solution to plastic. Ecobricks and all the applications on this site are a fundamentally 'Cradle-to-Cradle'.